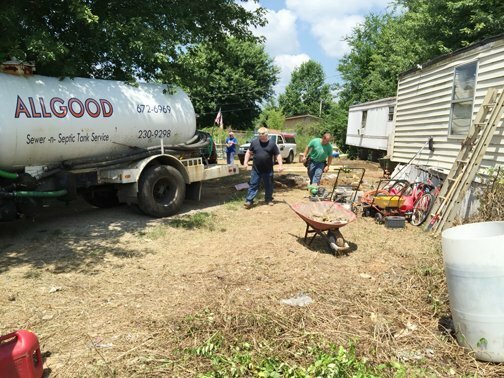 Allgood was called out to pump a septic tank in Robertson County, TN. It was a normal day in late July and Tennessee was baking in the sweltering heat (of 2016) with a heat index frequently hitting into 90° or more. Upon arrival Ernie noticed a busy work crew around the property. 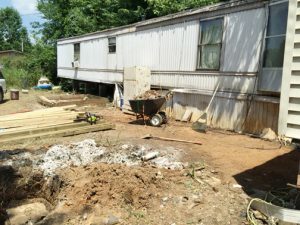 They were cleaning up trash, miscellaneous debris, tearing off an old deck and repairing a shed. Everyone was working hard everywhere in this insane heat! The septic tank hadn’t been pumped in years and was difficult to pump, but it’s hard to stop when being inspired by so many others working hard everywhere. 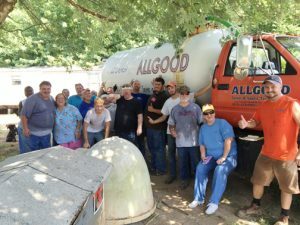 As he talked with the different workers, he found out this work crew was on a mission trip from Louisiana and had come to Tennessee through Mission Discovery. When the job was completed Ernie decided to donate the septic pumping and an enzyme treatment to help the mission. The group was excited and thankful for his generous love gift. HIS Mission Team consists of several churches from the Saline and Castor areas of Louisiana, this trip also included teammates from Florida. Each year a group comes together for a week long mission to share the Gospel of Jesus Christ, do construction projects and hold Bible school for children. Learn more about them on facebook @hismissionteam. Mission Discovery organized the trip for HIS Mission Team. Mission Discovery coordinates projects, lodging and food for groups who wish to serve in the mission field in the USA and around the world. Learn more about Mission Discovery on their website www.missiondiscovery.org or on facebook.